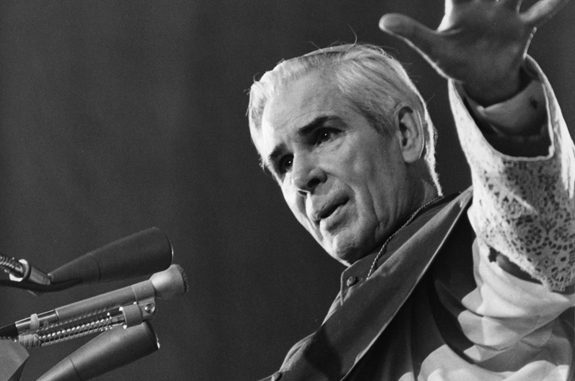 On June 28, 2012, Pope Benedict XVI promulgated a decree on the heroic virtues of Archbishop Fulton Sheen. The full text of the decree was subsequently published in 2013 in Acta Apostolicae Sedis (vol. 6, pp. 519-22). What follows is an unofficial translation of that text: the Vatican typically does not release official translations of these decrees. The decree inaccurately states that Archbishop Sheen was appointed bishop of Rochester in 1967; he was actually appointed the previous year. “But even if you do suffer for righteousness’ sake, you will be blessed. Have no fear of them, nor be troubled, but in your hearts reverence Christ as Lord. Always be prepared to make a defense to any one who calls you to account for the hope that is in you” (1 Pt. 3:14-15). In this exhortation of the Apostle Peter is found almost the whole existence of the Servant of God Peter John Fulton Sheen, who was a priest and bishop devoted to the glory of God and the salvation of souls. A genuine apostle of the modern age, the Servant of God spread the Gospel message, employing the most recent means of technology, energetically occupied with the instruction of America’s society—and he fulfilled his office with the generous strength of charity. The Servant of God was born on May 8, 1895, in El Paso in the State of Illinois in the United States of America, from parents who were Irish in stock and who ran a small tool store. Five years later, for the sake of the family interest, they moved to the nearby city Peoria. There the boy successfully attended schools, both of childhood education and of liberal learning. In 1913, Fulton, a young man, wished to pursue higher studies and was enrolled in St. Viator College in Bourbonnais in Illinois, a college that was directed by the Parochial Clerics of St. Viator. In those years, he clearly foresaw a priestly vocation. He renounced a yearly scholarship that was offered him for the sake of studies and was accepted at Saint Paul Seminary in Minnesota. When the course of studies was completed, he was ordained a priest on September 20, 1919. In 1920, Father Fulton obtained a baccalaureate of canon law and of sacred theology at the Catholic University of America, and afterwards also was declared a doctor of philosophy at the University of Leuven. In the academic year 1924-1925, he received the mandate of delivering a course of dogmatic theology at St. Edmund’s College in Britain. On July 6, 1925, he passed, in the best manner possible, the final examination at Leuven (agrégé) for teaching philosophy, with the status of professor. He was named professor at the Catholic University of America, a position that he held until 1950. Father Fulton Sheen, in March 1930, became moderator on the radio broadcast whose name was The Catholic Hour, which he directed for 20 years, gaining in a short time a very great number of listeners and also the singular support of the people, with the result that there were not a few who converted to the Catholic faith. For this reason, the Supreme Pontiff Pius XI named him Domestic Prelate. From 1950 to 1966, he was assigned the direction and care of the whole National Society of the Propagation of the Faith; fostering particularly the missionary activity of the Church, he carried out this duty. On May 28, 1951, he was named auxiliary bishop of New York. In the ensuing years, the Servant of God continued his apostolate with new fervor through the means of social communication, and he moderated a program whose name was Life Is Worth Living, which, moreover, was broadcast by almost 500 television and radio stations, reaching three million listeners in a week. In this role, he distinguished himself with supreme diligence and care, explaining with effective simplicity even the more difficult things of faith. In this noble service, he gained in 1952 the television prize of the greatest importance, commonly called the Emmy Award. In those years of fruitful apostolate, the Servant of God also encountered not a few impediments, difficulties, and disagreements. Nevertheless, he began to undertake very many journeys around the world for accomplishing his duties. Because of this effective activity, the Blessed Pontiff John XXIII named him to the Pontifical Commission for the Evangelization of Peoples and noted that he was a more engaged and constant leader in the preparatory sessions of the Second Vatican Council. The Servant of God, the Pontiff Paul VI, also employed him after the Council on the Commission on the Missions. On October 21, 1967 [sic], the Pontiff entrusted to him the Diocese of Rochester in the State of New York. There, Bishop Fulton reorganized and renewed all the institutions. He encouraged the activities of the Church, the care of souls; supplying for the education of pupils, seminarians, and clerics, he arranged the greatest support and care for the needy and sick. In every matter, the Servant of God applied the proposals of the Council and proclaimed them, especially toward the weaker rank of society, in this manner bringing about a true pastoral outreach to the marginalized. The Pontiff Paul VI greatly esteemed his apostolate. In October 1969, the Holy See accepted the Servant of God’s resignation, naming him titular archbishop of Newport. In this way, he was able to return to New York, where he wanted to live in a small and humble residence, carrying out domestic matters by himself. And moreover, in this last period of life, he was able to resume the service of teaching and preaching, both in the United States of America and in European nations. His singular pastoral activity is established on, and guided by, a most solid interior life, which was sustained daily by the Eucharist, liturgical prayer, and Marian devotion. The presence of God was constantly perceived in his life; in this manner, the exercise of the virtues naturally flowed forth in his life, and in many incidents, there was in him an example of virtue and sanctity. On July 15, 1977, he suffered when he underwent heart surgery, at the risk of life, and thus his health was greatly diminished. On October 2, 1979, neglecting his own circumstances of health, he wanted to be present at the discourse with the Blessed Pontiff John Paul II, who was conducting an apostolic journey through the United States of America. On this occasion, the archbishop arrived at the Cathedral of New York by ambulance, and the Pontiff, embracing him, greatly praised his constant and intense dedication in the diffusion of the words of God and his singular faith in the Church. On December 9, 1979, in New York, the Servant of God piously departed from mortal life. Because of his reputation of sanctity, a diocesan inquiry was held at Peoria’s curia from 2004 to 2008; the inquiry’s juridical validity was approved by this Congregation for the Causes of the Saints by decree on October 17, 2008. When the Positio [biographical summary] was written up, the question of whether the Servant of God cultivated the virtues in a heroic manner was discussed according to the norms. On October 28, 2011, a Particular Congress of Consultor Theologians was held, with a positive conclusion. With me, Cardinal Angelo Amato, presiding, on May 15, 2012, when the relatio [report] of the Ponens [Proposer] of the Cause, Cardinal Francis Arinze, was heard, the Cardinal Fathers and Bishops in Ordinary Session declared that the Servant of God cultivated the theological, cardinal, and connected virtues in a heroic manner. Finally, after an accurate report about all these things was made to the Supreme Pontiff Benedict XVI by the undersigned Cardinal Perfect, His Holiness, welcoming the wishes of the Congregation for the Causes of Saints, and regarding them approved, declared today: that there is certainty about the theological virtues Faith, Hope, and Charity, both toward God and toward neighbor, and in addition about the cardinal virtues Prudence, Justice, Temperance, and Fortitude, along with the virtues connected to them, in a heroic degree, of the Servant of God Peter John Fulton Sheen, titular archbishop of Newport, at one time bishop of Rochester in America, in the cause and for the effect under discussion. Given at Rome, on June 28, in the year of the Lord 2012.